FAA Airplane Checkrides (Practical Tests), including Private Pilot, IFR, Commercial Pilot, CFI, Multi-Engine, ATP, and more. FAA Helicopter Checkrides (Practical Tests), including Private Pilot, IFR, Commercial Pilot, CFI, Multi-Engine, ATP, and more. All FAA Glider checkrides (Practical Tests), including Private Pilot, Commercial Pilot, and CFI-G. Ever wanted to fly a glider? It's incredible fun and, some would contend, the "purest" form of flying that man can do. It's you, the glider, and the sky - and not much else. Whether gliders are your first exposure to piloting or you are thinking of adding a glider rating to an existing pilot certificate, you are embarking on an exhilarating journey. Alas, between you and your goal of becoming a proficient and certified glider pilot is the little matter of the FAA combination flight and oral test known as the "checkride." This is where we can help. This software can prepare you for any or all of: Private Pilot Glider, Commercial Pilot Glider, and CFI-Glider (Flight Instructor). 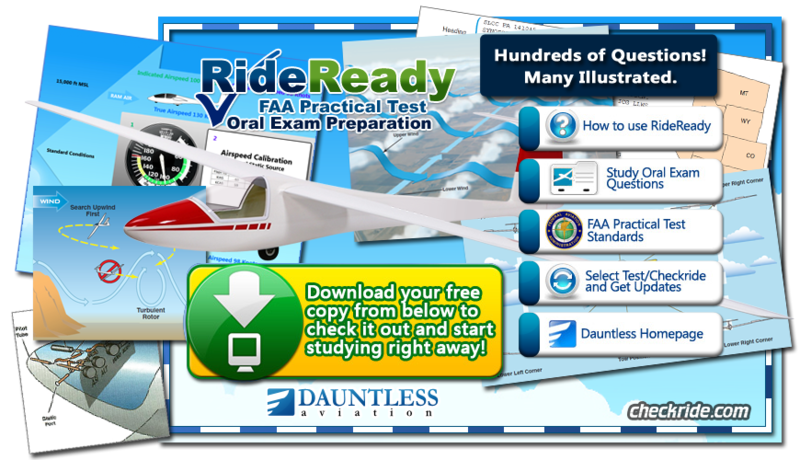 Our RideReady: Glider Pilot software will, in an interactive question-answer presentation style, take you through the key knowledge points as determined by the FAA and experienced glider pilots that are crucial for safe and effective glider operation. RideReady: Glider Pilot is both for pilots who already have an existing pilot certificate/rating and want to add a glider rating (either private or commercial - this software works for both) and for those whose entry into flying is via gliders. Regardless of which category you fall into, you will have to take an FAA checkride and demonstrate to an examiner not complete mastery of every last technical detail, but rather a solid functional knowledge of terms, procedures, and contingencies associated with soaring / glider flying coupled with sound judgment and effective problem solving skills. For years after you get your glider rating, as a refresher tool. RideReady: Glider Pilot includes free lifetime upgrades. You can be studying using RideReady: Glider Pilot in minutes - just download and install the software from below. It's available on a "try before you buy" basis to ensure your satisfaction. We thank you for giving it a try. Questions? Please let us know - we're here to help! Who is this software intended for? RideReady: Glider Pilot is both for pilots who already have an existing pilot certificate/rating and want to add a glider rating (private, commercial, or CFI - this software works for all three) and for those whose entry into flying is via gliders. Regardless of which category you fall into, you will have to take an FAA checkride and demonstrate to an examiner not complete mastery of every last technical detail, but rather a solid functional knowledge of terms, procedures, and contingencies associated with soaring / glider flying coupled with sound judgment and effective problem solving skills. When should I start studying for my checkride oral? Ideally, you should start studying as early in the training process as you can. Having more knowledge earlier on will help you make the most of your training flights and therefore likely save you training money / time over the course of your training. That said, RideReady is perfectly suitable as a "night before the checkride" cram tool as well. Aerotow vs Winch-launch? What about motorgliders and the like? Yes, this software will help prepare both aerotow and winch-launch glider pilots. It also has questions and content for pilots flying a number of motorized glider types. The Private and Commercial Glider Pilot certificate knowledge requirements are actually quite similar in many ways (with the major difference between the ratings being the precision and type of maneuvers you are expected to fly and the relative degree of accuracy of your answers to oral questions). This software can help you prepare for both ratings. The glider knowledge questions for CFI (Certified Flight Instructor) are fundamentally similar to those of Private and Commercial Pilot Glider. However, the CFI applicant must know the answers extremely well! RideReady: Glider Pilot can certainly prepare you for the Glider CFI checkride oral in this regard. However, this software also has glider-specific quesetions pertaining to the theory of teaching and learning - what the FAA calls the "Fundamentals of Instruction." There is no way around the Fundamentals of Instruction - you WILL be asked FoI questions on your CFI checkride. Fortunately, this software has what you need to prepare for that and will help you prepare in as easy and painless a manner as possible. Why does RideReady not grade answers right and wrong? Unlike on FAA written tests where questions have obvious and definite answers, many checkride oral questions are intended to probe your functional literacy and reasoning skills. Answers are often rich and detailed. Therefore, it is impractical to grade your answers strictly. Rather, RideReady leaves it up to you to see how your answer compares to ours. That said, RideReady allows you to flag questions as easy, neutral, or hard so that you can zero in on questions of importance to you. By the way, if you need FAA written test prep software for glider (or for airplanes, helicopters, etc), check out our GroundSchool software. Do I have to know ALL of the content of RideReady before taking my checkride? Generally speaking, It is a good idea to know the vast bulk of the content of RideReady that pertains to the aircraft you fly. However, of course, while it is helpful for you to know as much as you can, examiners give reasonable leeway for little gaps here and there. Still, to increase your odds of success, study up! Fortunately, RideReady makes this easy. How much does RideReady cost? This product will help you prepare for all three of the Private Pilot Glider, Commercial Pilot Glider, and CFI Glider checkrides, including the Fundamental of Instruction topics that you are required to learn for your CFI Glider checkride. For those who have it in them to tackle some of aviation's greatest challenges, this bundle inclues four RideReady titles (Balloon Pilot, Glider Pilot, Seaplane Pilot, and Tailwheel Transition) at a great value price. Of course, few, if any of us, do all four in a short time frame, but remember - your RideReady purchase entitles you to free lifetime personal upgrades, so it'll be ready when you are. How many questions does RideReady contain? This is a constantly evolving answer, since we constantly update RideReady as necessary. A general answer is "several hundred." (Some versions of RideReady have over 1000) For the most complete answer, download RideReady and give it a try, remembering that the demo version gives you access to only about 5% of the questions. How can I be sure that the information contained in RideReady: Glider Pilot will be compatible with my course? RideReady: Glider Pilot very closely follows the FAA recommendations and practices for glider / soaring / sailplane flight, so the chance for discrepancy is quite low. In fact, much of RideReady comes from exact FAA recommendations on the subject that have been categorized, organized, and edited to make your learning very efficient. What happens when updates are released? Updates are always free, so, unlike limited-lifespan books, RideReady will serve you well into the future! There is an update link from the main menu. Click that, select the test you want, and follow the instructions to get the latest and greatest. Getting upgrades is integrated, fast, and free. Thanks for checking out RideReady! Good luck in all of your soaring goals!